Pennies for Patients Campaign is our next service learning project. Between February 12th-March 2nd, we will partner with the Leukemia & Lymphoma Society to support their mission to cure blood cancers and improve the lives of patients and their families. Volunteers — Mark Your Calendars Now! The Volunteer Breakfast will be held April 18th from 7:30-9:00 am in the cafeteria. This is a chance for Brockman staff to thank our amazing volunteers! Please plan to join us! Hello parents! 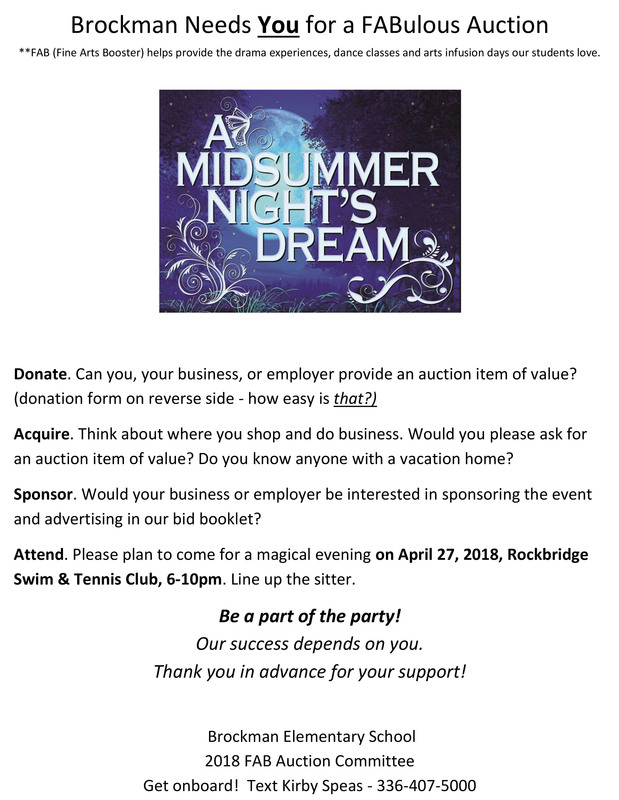 Hopefully, you’ve already marked your calendars for Friday, April 27th, for a spectacular evening celebrating our school, families, and arts programs at the Rockbridge Swim & Tennis Club. We are looking for 20 individuals who are willing to step up now to help us acquire fun and desirable prizes for our art auction. We are so fortunate to live in a generous community where many businesses will participate, if asked. When everyone does a little, we have a fantastic arts fundraiser. We challenge you to make a meaningful contribution to Brockman by being a part of the acquisition team. We will be meeting in the cafeteria on Friday, February 16th, at 7:30 am to discuss plans. Please come and share your ideas for the auction. We need you!! Did you know your unused/gently used luxury items such as unused wedding presents, mom’s sterling, a designer purse could bring in money for our school? Please consider donating unused valuables in yours or a family member’s home. Acquisition forms are located in the front foyer of the school. Turn one in to your child’s teacher today! Contact Kirby Speas at 336-407-5000 (email kirbyspeas@aol.com) if you can help. Sign up now for our Parties With A Purpose! All proceeds support FAB (Fine Arts Boosters). Click here to sign up. Keep Turning in Those Box Tops – We just need 25 per family! Thank you to everyone who has been sending in Box Tops!! We are making progress! If each family sends in just 25 Box Tops before the end of February we can reach our goal! Our next submission deadline is March 1st. Please send in all Box Tops before February 28th so they can be counted in the submission. We are changing things up a bit this year by moving Staff Appreciation Week to February. Our hope is to alleviate the busyness of the month of May, while still treating our staff. Please sign up at the link below to help out with morning duties, flower sales, and food donations for teacher breakfast all week long during the week of February 12-16. If your child(ren) is interested in buying a carnation for a teacher or staff member, please send $1/flower/staff, or you can get 6 for $5, between Tuesday, Feb 13 and Thursday, Feb 15th in the cafeteria before school. Thank you! We need you Brockman parents! Are you ready to make a difference at Brockman? The PTO Executive Board needs to fill the following positions — VP for Fundraising, Secretary and Treasurer. If you are willing to fill any of these positions (or would like more information about the responsibilities), please email Ashley Lindler at aflindler@hotmail.com. Our goal is to have these positions filled and ready for election at our next PTO meeting on March 8th. Please consider volunteering your time and efforts. We’ll be celebrating Staff Appreciation Week during Valentine’s Week! Please click here to sign up to help out with morning duties, flower sales, and food donations for teacher breakfasts. We still need quite a bit of help with morning duties. Also, if your child(ren) is interested in buying a carnation for a teacher or staff member, please send $1/flower/staff, or you can get 6 for $5, between Tuesday, Feb 13 and Thursday, Feb 15th in the cafeteria before school. Thank you! The Annual FAB Arts Auction is scheduled for Friday, April 27th, at Rockbridge Swim & Tennis Club, and we need your help! We would like to challenge each family to try to support our arts programs in some way this year. Please spend two minutes thinking about your extended community — where you shop and who you do business with, and whether there is an opportunity for them to support our school. Think big and think outside the box! Questions? Interested in helping? Send a text message to Kirby Speas at 336-407-5000.